These next three days I will journey through the stories of Jesus’ last supper, the prayer in the garden, the excruciating trial and crucifixion. And eventually, death not having the last word. I cannot pick a favorite story of the bible, or a favorite scripture, or even a favorite book. I can tell you why I would choose Mark or John’s feeding of the 5000 story over Matthew or Luke. Why the prayer of the shema is so important to me. Why the Old Testament stories add such a complexity to my understanding of family and human life. 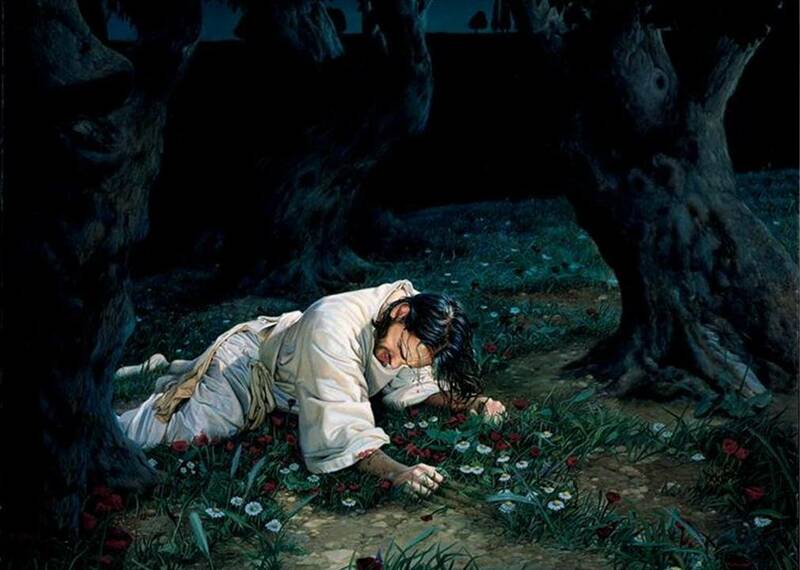 I can also tell you I am a Christian today because of the prayer Jesus prays in the Garden of Gethsemane. I am the daughter of a catholic and a mainline protestant [and the step-child of two southern baptists(ish)]. Although church was on and off, my family is Christian, I was raised with church on Christmas and Easter and some times in-between. I was also raised with the concept that these were the things we did before the family gathered for the holiday meal. Despite being “raised” Christian, there is no question when I “became” Christian. I know when I accepted that God was working in my life, I can look up the dates I was baptized and joined the church, I can tell you the story of my first communion and I can also tell you the moment I became a Christian. An aside: saying “the moment I became a Christian” is really creepy to me. Having been raised for a time in the southern Baptist tradition I have to say this is a little too close to “when were you saved” but there really was a definitive moment I decided to be Christian. Life wasn’t good and I struggled. I received my call to seminary when I was 18, but life happened, or continued to happen I should say. I ran from God for 2 years after this call. I know, not that long, but I ran hard, my life crumbled. I moved to Memphis running away from my hometown, I moved to Louisville, running away from Memphis. I ran from Christianity most of all, not from God, but from religion. I could not give up on God… ever. But I wasn’t so sure about Jesus and the church. My junior year of college I transitioned from a Music Education degree to a BA of Arts in music with a religious study minor. I studied world religions and I loved it. I was not “seeking” for a specific religion but wanted to learn and study all the different ways people knew and experienced God. To fulfill the requirements for the degree I had to take a course in Christianity, admittedly I was not as happy about this. Yet, Introduction to New Testament I went… The class was taught by an ordained southern Baptist and was full of bible-thumping born-again engineers fulfilling their humanities requirement. I hated every moment of it. Except, I had to read the New Testament. And I got to the moment of the Garden of Gethsemane (I like Matthew’s version the best). And I was transformed. “Now that’s a guy I can follow.” I even said out loud in my apartment. This guy gets it. This God gets it. I can follow him. I can teach his teachings, I can pray to a God who gets it. This Jesus gets me, he understand what it is to live this life. That life is hard and complicated, that there are impossible choices to make. Yet at the end of the day, I believe in the gracious mercy of God and I am at God’s will to be used in the way God would have me be used – for love and compassion even if that means pain and heartache at times. This is why Augustine left his mistress and child. This why I not only went to seminary but why I am in church on Sunday morning. Even more than that – it is why I don’t actually care if anyone shows up for service tonight, or tomorrow, or on Sunday. Their loss if they don’t. And Jesus knew it. And so do I. God doesn’t stop the human feelings of burden, of wishing it wasn’t so. I know what I must do, ultimately what I will do, but until then, I beg you, don’t make me do this. So I will be in worship tonight, I will serve communion, and I will read Matthew’s version of the garden of Gethsemane. I think it would be great if you were there. Will you stay awake and pray with me a while? This entry was posted in Ministry, Prayer, Worship and tagged begging, garden of gethsemane, God, holy thursday, Holy Week, Jesus, Lent, Maundy Thursday, prayer. Bookmark the permalink. That’s a wonderful statement of faith. Wow! Well I’ll be there with you tonight praying. Found your blog post through a Facebook post of Bill Habicht. I’m home sick, working on weekend pastoral responsibilities. My husband and son have gone to worship. Ah, God’s word has come to me anyway. Thanks be to God for this insightful post. I am grateful for you, Bill, the internet and Facebook.